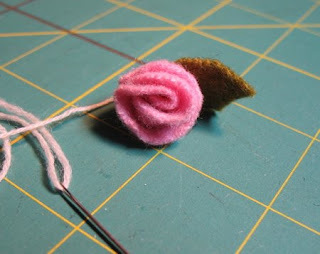 My favorite doll maker, Mimi Kirchner, has posted a nice tutorial for the sweetest, itty bitty felt rose on her blog, Doll. A couple of interesting bits from Portland's own Sister Diane. Blogging as a Way to Market Your Crafty Business. The 101 beginner class is April 5th, and the 102 intermediate class is April 13th. You can take either or both. Just follow those links for more info and registration. These classes are held at the fab DIY Lounge, and are always a great time. She would love to see you there! I do so wish that she would offer the information in downloadable form that we could purchase! Kalmbach Publishing has given Diane three copies of Make It Mine magazine to give away. She is holding a drawing to choose the lucky recipients. Visit CraftyPod, leave a comment and keep your fingers crossed. 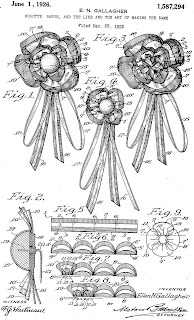 This rosette is a lapel pin but the same technique would make a good decoration for the pews at a wedding, decorations for 4th of July bunting and even as awards for kids for the summer reading program. Recently I've been studying the modeling clay patents and have been surprised that the older compounds are similar to the products offered today. A friend needs a way to sculpt a wedding cake topper and and decorations for the favors. She does not want to use polymer clay and we think that cold porcelain will give her the delicacy and translucent quality she desires. The following links provide a wealth of information. A silly type putty from Steve Spangler Science that looks like tons of fun. It's a lesson about creating polymers. My sister is going through her piles of craft related finds and putting them on here-Bay page . 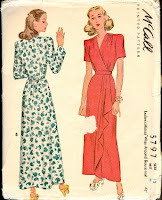 She has a nice 1944 wrap dress pattern and is working on putting up portions of her vintage trims among other things. Stephen and Kim Fraser are posting tips on the Spoonflower blog for preparing the artwork for your printed fabric. Visit, get help and ask questions. I can hardly wait and wish them all the success in the world. While I'm thinking about floorcloths I want to share my best design source for rug designs. 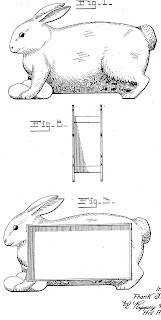 Google Patents has more patent designs than I will ever be able to explore. Some search terms might help here. 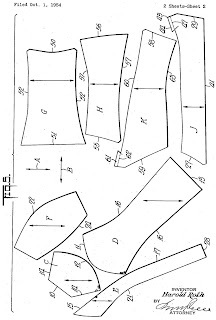 Search with the word design and look in the list for patent numbers that have a capital D in front of the numerals. Design for a rug, linoleum, Congoleum, oilcloth, Bigelow etc. One search term at a time. Some of the designs from the 20's and 30's are surprisingly modern. Click the pictures above to be taken to those designs. If you are willing to dig there's a wealth of inspiration. Lisa, of Canvasworks Floorcloths, is making canvas refrigerator covers attached by magnetic sheet. This is such a cool concept, go see. 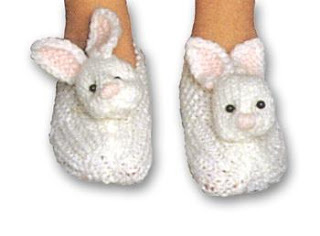 Aren't these the cutest? Patricia (Agence Eureka) does it again! Catch my heart. Thank you, friend. Click these photos to be taken to her blog and then click her pictures to go to her Flickr set. She offers full size printable images so you have to click on "All Sizes" at Flickr. 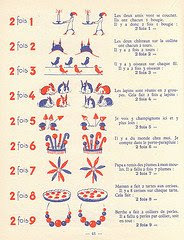 Cute math lessons are in the same Flickr set. This is just two of them. These works of art are so beautiful. Go see. 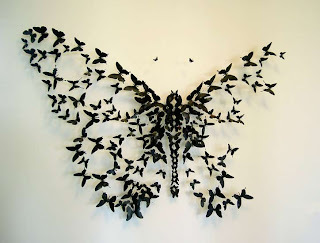 I can't help but wonder if all these butterflies were cut by a laser. The artist did attend Carnegie Mellon whose students are doing some very interesting DigiFab (digital fabrication) work. Ponoko has chosen the 25 entries who have made it through to the Invitation Round. 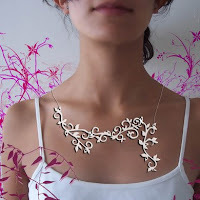 Visit the Ponoko blog to see the fantastic designs. 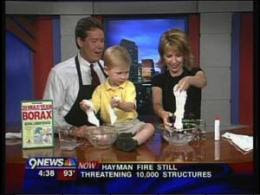 Marcel's Kid Crafts is a site written by a kid for kids. He writes and sells his own craft pattern e-books, keeps an interesting blog of ideas and links and offers a newsletter. Be sure to check out his "About" page. 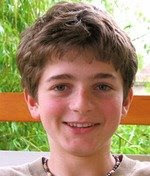 He also plays piano and has posted videos to You Tube. I really am behind the times and only just started to read this really great blog. I do most of my searches through Google Images but have found that often this blog already had that resource. They have posted tons of links to tutorials, sources and pretty much anything you can think of. If you haven't visited and like my posts, you will want to be a regular reader! Subsciptions to the magazine are available there too. 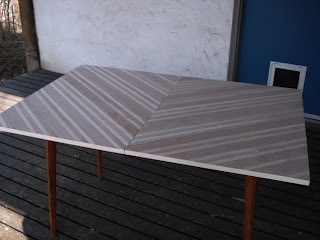 Danny Seo used iron on wood veneer tape to bring an old table back to life. Photos of the project are here. His blog, Daily Danny is new to me but I like it. 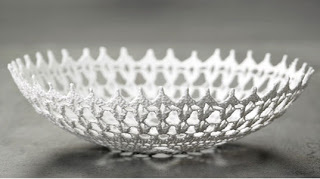 Quite a bit ago I saw this post on Inhabitat about these crystallizing salt doily bowls from The Home Project. Crystallizing salt? What's that? Can I do it too? I found this salt sculpture activity at the Exploratorium. It seems to be the right thing. Make a supersaturated salt solution, put cotton string in and let the water evaporate. Sounds good but how to get the bowl shape? Put the doily between two bowls the same size and fill the void with the solution? 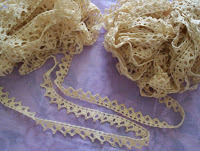 Pin the doily to a plastic bowl, weight and submerse in solution? Place the doily over an overturned bowl placed in a tub and bathe with solution? I don't know but I want a couple of these for gift baskets and to hold glass ornaments for Christmas. That should be enough time to figure it out. 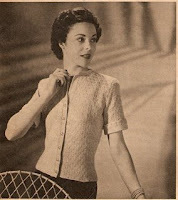 Meggiecat reader and friend, Shay, has shared some really cute vintage knitting patterns on her blog, Little Grey Bungalow. Thank you! 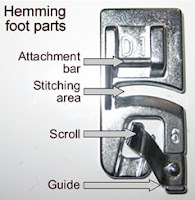 Step by step tutorial from Dollhouse Noah. The material is sawdust and paste molded over floral foam that is raked out of the pieces after drying. 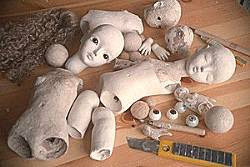 Sawdust is often called wood flour and has been the base for many composition dolls and modeling clays. 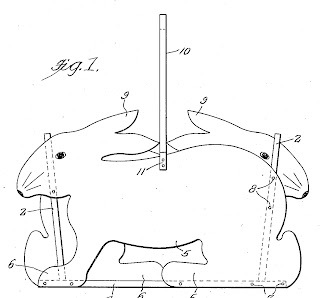 Google patents offers a wealth of information that I may get around to posting. In the meantime check out this tutorial. Barb Lawrence aka Woof Nanny's blog all about creating and altering handbags. Tips, inspiration, links to patterns and so much more. She really blows me away with her generosity. I couldn't pick just one picture to show. You'll have to visit to see for yourself. Be sure to also check out her craft blog, Woof Nanny; it's a favorite of mine. Preserving The Crafts And Trades Of Yesterday One Book At A Time. 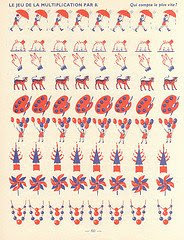 Lost Crafts is an online collection of free crafts and trades books. The collection covers bookbinding, papermaking, blacksmithing and making tin can toys. I adore this tutorial from the Berlin craftblogger LimonVerde. She uses high tech CraftRobo and low tech embroidery hoop to create her prints. Since I'm not an artist, her technique appeals to my cobble together a way to get it done mentality. I had a difficult time getting all the pictures to load but a right click, Show Picture worked for me. Don't want to cut an entire stencil? Think in reverse. Punch some shapes from the acetate, spray with adhesive and apply to the screen. On another note, I have had an interest in the pochoir printing process. Hand coloring using stencils. I always knew I would not be able to cut the color separations by hand but the CraftRobo tool is the perfect tool to get those stencils. Here is a good explanation of the pochoir process. I've shown you what other companies can do for you and now I want to show you what you can do for yourself. Desktop manufacturing is an exciting concept. CraftRobo is a personal cutting plotter. This is an amazing machine, priced in my range. Want your own vinyl wall decals, tags or shaped labels for your products, fancy cut picture mat, stickers? Watch the video on the CraftRobo site. I spoke with a rep. for supplier Ordway Sign Supply and want this package for the CraftRobo Pro $895. I like the pro because it cuts wider material and can handle materials on a roll and cuts faster but the CraftRobo itself costs less and is a great tool. Cutters for heavier materials like mats and 45 and 60 degrees are in the accessories. Look here for CraftRobo for $329. The CraftROBO can accept material up to 11" wide with a cutting area of 8" by 39"
Don't want to design your own but still want wall decals and words and die cuts,cards and boxes? Check out the Cricut from Provo Craft . Here is a Google Shopping Search that shows this product at WalMart for $184. I saw a demonstration of this machine. Slick, easy to use and understand. Yes, you can have your own desktop laser cutter. 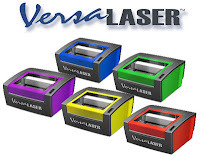 VersaLaser™ says it can transform images or drawings on your computer screen into real items made out of an amazing variety of materials…wood, plastic, fabric, paper, glass, leather, stone, ceramic, rubber… and it’s as easy to use as your printer. Check here to see what VersaLaser does. Starting at $7,495. Out of my league for now but thinking about what it can do. Cut and incise my own buttons, the hardware or handle for a bag. So much more but just thinking about the potential puts my head in the clouds. Maybe it will come down in price in the future. Microwave ovens did!! Even Sears is in the game with the Craftsman CompuCarve Computer-Controlled Compact Woodworking Machine. $1899.99. An accessory is a 3-D Scanning Probe that enables height mapping of existing surfaces and objects that can then be imported into the CarveWright software libraries for use on any project. Reading the reviews.... this product may have some manufacturing quality control issues but then I did not buy one of the first Microwaves to come out either. Beam me up Scottie. Replicator, I'll have this handbag, purple please. The survey is closed but you can visit the Spoonflower blog where you can sign up to be notified of the Beta launch. Spoonflower also wants to see our projects and products. Send in your pictures. This was brought to my attention by Diane Gilleland, Portland's own author of CraftyPod . Thanks so much! I haven't been this excited about a resource in years!!!! Spoonflower is the brain child of Stephen Fraser, formerly of LuLu.com and owner of Bug-Eyed Marketing, an online marketing agency. Custom, on demand fabric printing. Yes, please! I want it now! Spoonflower isn't up and running yet but they want to hear from us. Are you interested in this service? If so, visit Spoonflower and fill out the survey. Thinking about the potential here is causing my brain to explode. 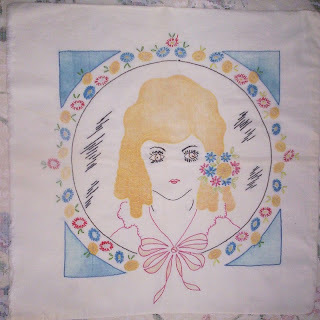 I could have my dolls printed, quilt squares, custom fabric with my logo for bags, a cool border print with a different field print on a panel to be sewn into a skirt. What if I were able to buy fabric or projects designed by my favorite illustrators and photographers? That's only the beginning of the thoughts. It appears that there will be different weights and fibers available. I was only able to choose one on the survey but in reality, I hope that all the choices will be available. Wouldn't it be nice to have the same design on heavy and light weights? One of the choices is upholstery weight. Think bags and art furniture! Digital printing of fabric has only been available to high end designers of clothing and furnishings, far out of reach of the small business or individual crafter. I'm looking forward to learning more about the process involved and what skills I will need to provide in order to get fabric printed. I grew up in Orange County, California. At that time the El Toro Marine Base was open so some of my friends were officer's kids. I came to admire their mothers more than I can tell you. These women really had it together. One clever trick they used for decorating was to apply fabric to the walls with liquid starch because it was not a permanent application and was very easily removed. I've been wanting to post about this technique. The good folks at Linit have complete instructions. 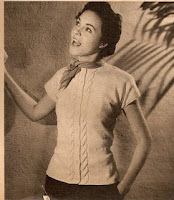 One thing they don't mention is that the technique works with small motifs cut from starched fabric (so it doesn't fray). Amy Ybarra Murphy. Photographer, printmaker, art teacher, mother and crafter. 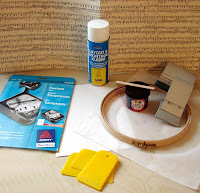 Her blog, Craft Chi, is new to me but I have her on my Bloglines feeds now because she's very generous with her knowledge and posts tutorials for all types of crafts. This picture is from her silicone caulk stamp making adventure. This site caused me to say OMG out loud! You design, they laser cut it for you. They are currently having a jewelry design contest. Do explore this site. Ponoko is the world's first personal manufacturing platform. It's the online space for a community of creators and consumers to use a global network of digital manufacturing hardware to co-create, make and trade individualized product ideas on demand. 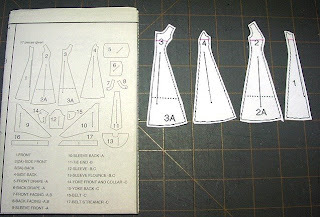 How to enlarge people pattern instruction pieces to get a fashion doll pattern. This tutorial is for fashion dolls but I see no reason that the same technique can't be used with children's clothing patterns to make clothes for other dolls and stuffies. From Dale Rae who also publishes a booklet that she uses in her workshops. Be sure to scroll all the way to the bottom of the page to see her skill. Her entire site is interesting. She makes pantyhose and socks for dolls that are available for sale. Check her patterns and shoes. Amazing work. The only free virtual makeover that allows you to try on celebrity hairstyles, celebrity makeup looks, and hundreds of haircolors and cosmetics on your own photo. You can use BeautyRiot's for free. 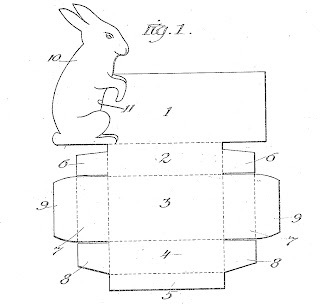 3 Easter project ideas from Google patents. 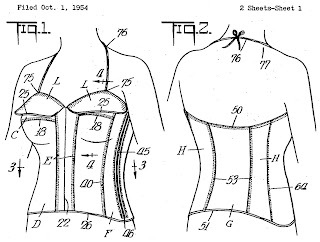 This method could help with the halter top patent drawing. The shapes here have so much potential. I'm loving the flaps at the top and the seams across the cups. What could be more iconic of those glamorous times?